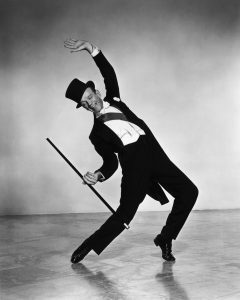 Astaire started performing as a child, partnering up with his older sister Adele. The two toured the vaudeville circuit before making it to Broadway in 1917. Among their many productions the brother-sister team starred in the 1927 George and Ira Gershwin musical Funny Face. For all his early success, though, career in the movies eluded Astaire. He had done a screen test, but he failed to attract any interest. A studio executive wrote at the time, “Can’t sing. Can’t act. Slightly balding. Can dance a little.” He eventually appeared in 36 musical films.